Driving into Hanoi, the capitol of Vietnam, after passing banana trees and people sitting under the overpasses having tea, you immediately fix your eyes on the sidewalks teaming with life: small food carts with sandwich fixings, little cauldrons steaming with soup, people sitting on low plastic stools around small, kid-sized plastic tables all while thousands of motorbikes zoom by. At night the streets team with people drinking bottled or keg beer (what they call “fresh bia”), eating bowls of stir-fried noodles with vegetables and beef or plates of spring rolls before walking to the frantic night market to get tapped on the shoulder by a little old lady carrying a wicker basket full of delicious glazed doughnuts. 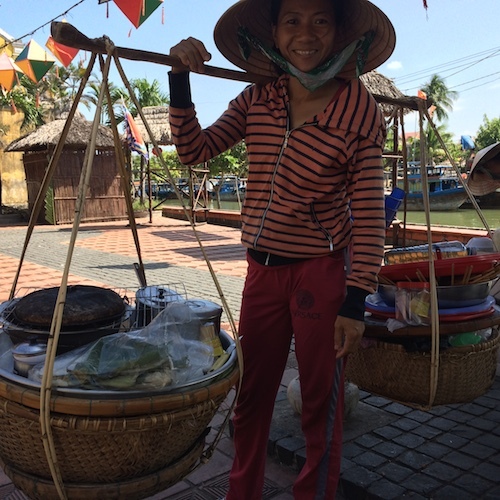 There is a lot Seattle, a city that prides itself on its food, could learn from Vietnam, a country I recently spent a couple weeks in, traveling from rambunctious Hanoi to humid Ho Chi Minh. Below are seven ideas Seattle might want to consider adopting to our beloved food scene. Settle can be more of an outside eating culture. 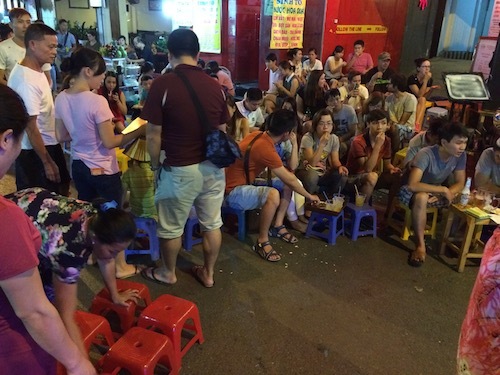 Maybe the most fun thing about Vietnam’s food scene is all the people eating on the sidewalks. When you walk up to a pho, bun, pancake, or ban mi food cart, which are everywhere, the smiling proprietor will unstack a few sun-washed chairs for your table. The climate in Vietnam is warmer than in Seattle, but it’s something we can try in summer and it’s an eating experience, as you wait for the food, breathing the air that smells of soup, that might bring us out of our apartments and into the social streets. Peering into in the food carts you see caramelized roast pork, piping pots, deboned chicken cuts (handled often without gloves), strainers piled high with green herbs, rice wraps and mountains of snow-white noodles. People are always chatting, smoking cigarettes, laughing around the food. Seattle has plenty of restrictions and permit requirements on this sort of outdoor dining – vendors can’t sell food without having running water on hand, for example – but after eating in Vietnam many of our restrictions seem, well, too restrictive. No need to be so squeamish. We took a wonderful cooking class on our second night in Hanoi where we made beef pho and bun with pork meatballs from scratch. 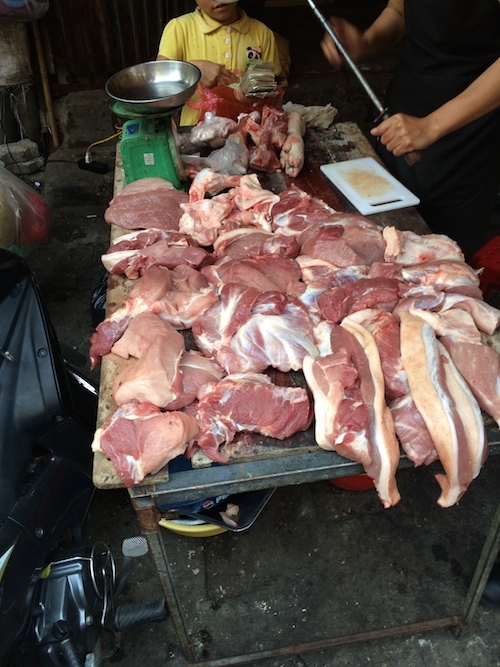 Before the lesson, the chef, Mr. Minh Tien, took us around the city’s expansive Dong Xuan market. Walking from booth to booth we saw and ate sea maggot pancakes made to order, deep-fried silk worms the size of almonds and balut, the semi-developed duck embryo eaten right from the shell. I will always remember Tien, an inspiring food connoisseur, scooping the head of the embryo out of the shell with its little grey eyes. Walking the market we also saw live soft shell turtles careening their green necks behind their cage, freshly cut fish heads, speckled quail eggs and squatting men skinning frogs in piles on the street corner. The one thing we didn’t see, but which was available in its own “village” a few miles away, were the snakes. 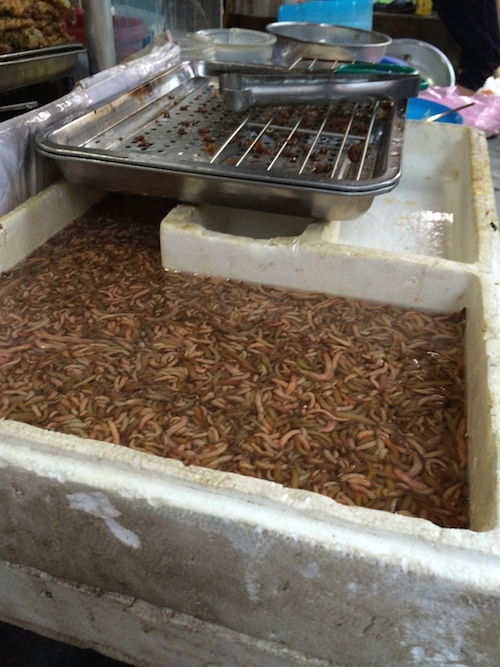 Talking food in Vietnam, the conversation often goes to the eating of snakes and their fresh beating hearts, which, rumor has it, gives the eater supreme energy. These foods seem so far out-there compared to what’s available in America, even at our own storied Pike Place Market, but they don’t have to be. Let’s step up our market game. Many of us lose track of what could be new and interesting for our palates. We are also detached from how our food is prepared and slaughtered that we have little-to-no idea what has to happen in order to bring a plate of spaghetti and meatballs to our table. This is where the market comes in. This is where seeing a cage of live rabbits piled on top of one another opens one’s eyes to food chain realities. During our travels, we never once saw a grocery store. People buy their meats, fruits and vegetables daily and take them home to cook (often right there on the street). There are many studies linking processed foods to cancer and in American grocery stores there is an over-abundance of processed foods. We need more fruits and herbs in our meals. After every meal in Vietnam we had fruit for dessert. Regularly it was watermelon, passion fruit, mango and papaya. There is something so satisfying to eating a lighter, vibrant, nuanced, herbaceous (read: basil, cilantro, coriander, mint) meal and finishing it off with a juicy fresh melon. Forget cake and ice cream, the flavors and cooking styles in the country lend themselves to lighter, yet-still-filling desserts. Another great example of this is the abundance of coconuts in the country. 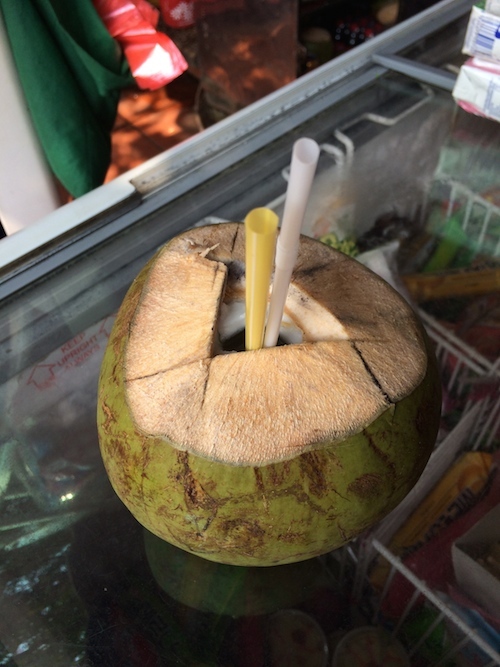 People walk the streets selling them, opening their tops with knives right on the sidewalk and sticking in a straw on a hot day. Expensive does not equal value. For most meals we spent what was the equivalent of $2. Sometimes we splurged and spent $8 (at the famous Morning Glory restaurant in Hoi An, for example, where we ate banana flower salad and homemade Cau Lau noodles with marinated pork). Beer, served in 12 oz. chilled mugs was 25 cents per glass. The average income in Hanoi is about $2,000/year, so it makes sense everything is much cheaper, but when you’re eating a fresh roll with lettuce, cilantro, half a skewer of barbequed pork, rice noodles and a little fish sauce, it also makes sense things are priced cheaply, especially when that roll comes from a cart or stand and not from a rent-hiked restaurant. Let’s understand pho better. Seattle loves its pho but in Vietnam you learn there are two versions of the noodle soup, one from the north and one from the south. Northern pho is milder, the broth is lighter, all the ingredients are served in the bowl and the noodles are a bit thinner. Southern pho (the style made in Seattle) is more deeply spiced and served in a larger bowl with hoisin at the table. Some ingredients – the herbs and hot peppers – are placed on their own for the diner to add as he or she wishes. Pho is primarily a breakfast food in Vietnam, too, a feature I was happy to wake to almost every day on our trip. It is served everywhere, including the streets, and each morning you can find a pack of people slurping their noodles and broth in the humidity. It’s a dish worth making from scratch, too, 24-hour beef bone stock and all. Food in boats. When we were on a cruise ship in Ha Long Bay, easily one of the most beautiful parts of the entire world – the blue-green water is spotted with over 1,600 freestanding cliffs – there were rowboats packed with food that would approach kayakers, swimmers and travelers offering their goods, from just-caught prawns to cans of Pringles. In Seattle, a city rich with waterways, we simply need more food in boats. utter a half-suppressed laugh; snigger; titter. 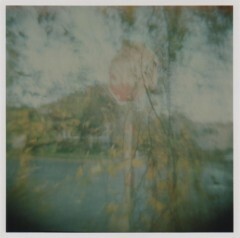 move with a sound as of something hurtling through or beating the air. a snigger; a soft, breathy whinny. the sound of something beating the air. Such Asian ingenuity, to make a basket out of such insubstantial, ephemeral stuff. The Hole lapses into pedantry yet again. My typos are least due to incipient blindness. Spell checkers don’t flag errors that result in a legitimate word. Arrogant of me to lecture a Sphincter-In-Chief of a site with literary pretensions, but VET YOUR COPY. Anyway, love TMR and certain of its staff. Settle can be more of an outside eating culture. Yes, I prefer to eat settled down. In spite of minor kerfluffles, this is an outstanding piece of travel writing. Alaska Airlines should snap this up for their on-board mag. That Uitti guy, what an elven genius.